MILL VALLEY, Calif. -- An elderly man who police considered armed and dangerous was found dead following a shooting at a Marin apartment complex, CBS San Francisco reports. Authorities say one of two people wounded in a Northern California apartment complex shooting has died and the other is in intensive care. The Marin County Sheriff's Office says the gunman, an 80-year-old man, later shot himself. Just after 5 p.m. local time, SWAT officers were seen setting of an explosive to break through a door of an apartment. There was no immediate word on what officers have found. 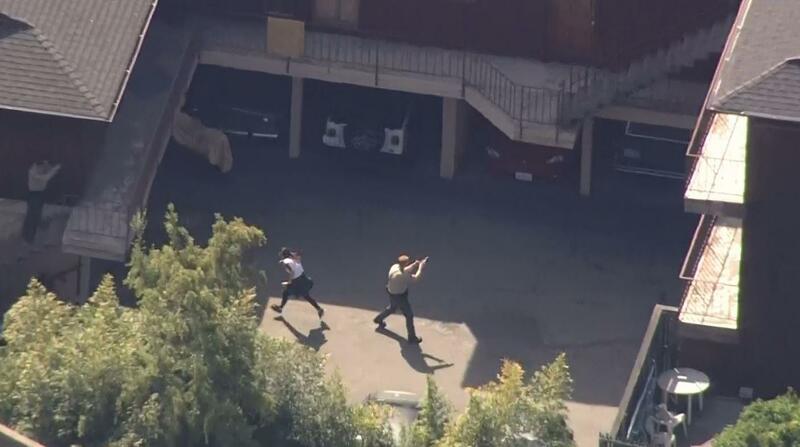 A spokesman for the Marin County Sheriff's Office said the report of shots fired came at 3:24 p.m. local time. Deputies responded to the location and found a man and a woman with possible gunshot wounds. "First deputies on scene grabbed the two victims and carried them out of the scene to waiting ambulances," said Marin County Sheriff's Sgt. Brenton Schneider. "Once they had the victims secure they started doing evacuations of all the apartments surrounding the apartment that we are currently fixated on." The suspect was described as an approximately 80-year-old man wearing a white T-shirt, approximately 5-foot-5 and armed with a gun of unknown caliber.